A strain refers to an injury to a muscle, occurring when a muscle-tendon unit is stretched or overloaded. 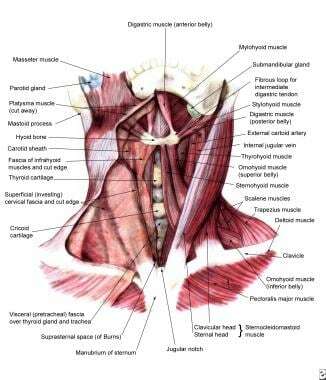 Cervical muscles that are commonly strained include the sternocleidomastoid (SCM), the trapezius, the rhomboids, the erector spinae, the scalenes, and the levator scapulae. A sprain refers to a ligamentous injury, and the diagnosis of cervical sprain implies that the ligamentous and capsular structures connecting the cervical facet joints and vertebrae have been damaged. Practically, a cervical sprain may be difficult to differentiate from a strain, and the 2 injuries often occur simultaneously. Pain referred to the muscle can arise from any source that is modulated by the dorsal rami. Numerous epidemiologic studies have been completed in the hopes of identifying the injury risk patterns that are associated with specific sports. Many athletes are reluctant to report minor injuries, and because the overwhelming numbers of sports-related spinal injuries are self-limited and resolve before being reported, the accuracy of these studies has been challenged. The mainstay of prevention and treatment of cervical spine injuries is maintaining good strength and flexibility through conditioning. For excellent patient education resources, visit eMedicineHealth's First Aid and Injuries Center. Also, see eMedicineHealth's patient education articles Neck Strain, Sprains and Strains, Muscle Strain, and Whiplash. Cervical spine injuries occur in an estimated 10-15% of football players, most commonly in defensive ends, linemen, and linebackers. [1, 2] The reinjury rate in high school football players following all cervical spine injuries is reported at 17.2%. Football players with 2 previous injuries are reported as having an 87% risk of reinjury. Wrestlers with no history of injuries to the neck have a 20% chance of sustaining a neck injury in a given year  ; however, wrestlers who have had a previous neck injury have an approximate 50% chance of recurrence. The spinal cord is protected by the cervical spine, which provides support for the head and allows for a significant amount of range of motion (ROM). [6, 7] Seven cervical vertebrae, stacked vertically, comprise the skeletal portion of the spine. Each vertebra (except C1 and C2) has a common body anteriorly and a ring of bone formed by the laminae and pedicles posteriorly. This protective ring of bone forms the spinal canal, which surrounds and protects the spinal cord. The tissues that surround the cord and the spinal fluid fill the remaining space. The C1 vertebra, or atlas, is ring-shaped, has large lateral masses, and attaches to the occipital condyles of the skull, providing support. See the images below. 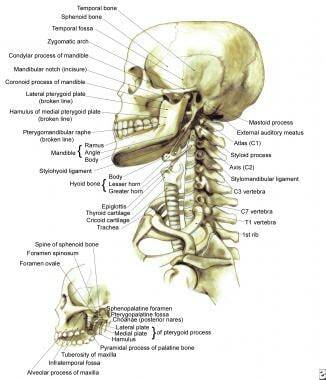 Bony framework of head and neck. 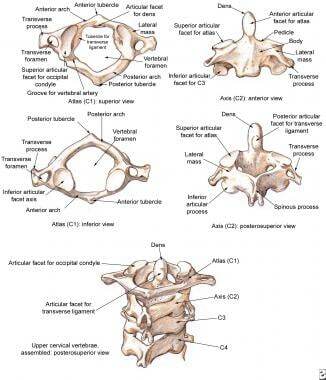 Cervical vertebrae, the atlas and the axis. The transverse ligament lies anteriorly between the 2 lateral masses of C1 and just posteriorly to the odontoid process of the C2 vertebra, or axis (see the image below). Projecting upward from the body of C2, the odontoid process is contained between the anterior arch of C1 and the transverse ligament. Displacement of C1 and C2 may be associated with rupture of this ligament, which may result in a spinal cord injury. 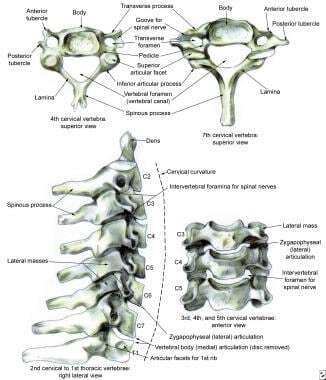 The remaining cervical vertebrae (C3-C7) are similar in function and appearance. The ovoid vertebral bodies are wider than they are tall. The bilateral raised uncinate processes located posterolaterally correspond to similar beveled surfaces on the inferior aspect of the superior vertebral body. These joints of Luschka, also known as uncovertebral joints, are not present in the embryologic development of the cervical spine but arise as a result of the degenerative and adaptive changes of annular tissue to stresses and loads. The lower cervical spine flexes and extends, and the atlantoaxial joint moves in rotation. During lateral bending, the spinous processes move to the convexity of the curve (spinous processes move to the right during left lateral bending) in the middle and lower cervical regions. Coupled lateral bending occurs in the opposite direction to the applied axial rotation above the C2-C3 level. Lateral bending from C2-C3 distally is always coupled with rotation in the same direction because of the approximate 45° inclination of the cervical zygapophyseal joints. The obliquity of the articular surfaces in the frontal plane determines the relative amount of side bending or rotation that occurs. The more vertical the joint surface, the more side bending is coupled; the more horizontal the joint surface, the more rotation is coupled. Regressive changes occur in cervical zygapophyseal menisci with age. The meniscus retracts and narrows between childhood and the fourth decade of life. The meniscus helps increase the contact surface area when articular facets come together, thus helping to transmit some of the load. The many articulations between the cervical vertebrae make the extensive ROM in the cervical spine possible. However, this large ROM comes at the cost of stability. Cervical spine stability is provided by a combination of the zygapophyseal joints and numerous ligaments and muscles. Extension, flexion, lateral bending, and rotation are permitted by the orientation of the zygapophyseal joints and ligaments. Positioning of the head makes combinations of these motions necessary. In a young person, cervical flexion and extension is about 100°. Bilateral rotation is about 80°, with approximately 50% of this range occurring between C1 and C2. The range of lateral bending is about 30-50°. Older individuals usually have reduced end ROMs because cervical mobility usually decreases with age. Intervertebral discs are located in between each of the cervical vertebrae from C2-C7. These discs consist of a water-containing central portion, the nucleus pulposus, and a tough fibrous outer ring, the annulus fibrosis. The discs are subject to prolonged and repetitive loading from muscle forces acting across them and from the weight of the head. With their viscous central portion, the intervertebral discs are able to transmit these forces between the end plates of adjacent vertebral bodies. These biconvex discs conform to the concavity of the vertebral bodies, and they also contribute to normal cervical lordosis because they are thicker anteriorly. Only the outer one third to one half of the annulus fibrosis in adults receives a vascular supply. The rest of the annulus and the whole nucleus pulposus are avascular. The annular fibers consist of 10-20 circumferential collagenous lamellae. The fibers within each lamella are oriented 35° from the horizontal, although the direction of inclination alternates with each lamella. As a result, rotation and translation are more likely to damage the annulus because resistance can be offered only by half of the lamellae whose fibers are oriented in the direction of motion. The functions of a ligament are: (1) to provide stability to the joint, (2) to absorb energy during trauma, and (3) to act as a joint position transducer during physiologic motions. Ligaments, along with the paracervical muscles in the cervical spine, prevent motion between vertebrae that might injure the spinal cord or nerve roots. 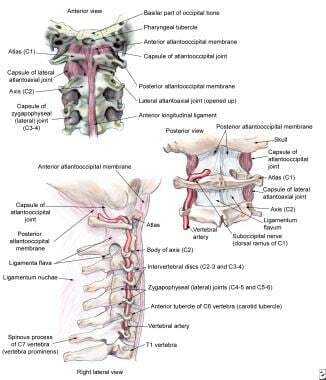 The cervical spine ligaments have numerous and complex interrelationships (see the images below). Running vertically along the anterior and posterior aspects of the vertebral bodies, the anterior and posterior longitudinal ligaments attach to the discs as well. The tightly attached posterior longitudinal ligament is thick in its central portion, which helps prevent a disc herniation from pressing directly on the cord posteriorly. The interspinous ligaments are also located posteriorly but are not as well developed in the cervical region. The ligamentum flavum, a yellowish elastic membrane, overlies the space between the laminae of adjacent vertebrae and the neural arches. The posterior location of the ligamentum flavum helps to restrain hyperflexion. The ligamentum flavum becomes shortened and thicker in hyperextension and elongated and thinner in hyperflexion. During hyperextension, it may protrude into the cervical canal as much as 3.5 mm. Impingement on the spinal cord during extension is normally prevented by the elastic properties of the ligament; however, hypertrophy of the ligamentum flavum or loss of elasticity through degeneration may lead to canal narrowing or cord impingement. The capsular ligaments, oriented approximately orthogonal to the articular facets, provide maximal mechanical efficiency in resisting distraction of the facets but relatively poor resistance to shear. The posterior longitudinal ligament limits flexion and distraction, the tectorial membrane limits flexion and extension, and the supraspinous and interspinous ligaments limit flexion and anterior horizontal displacement. The main function of the alar ligaments is to restrain rotation. 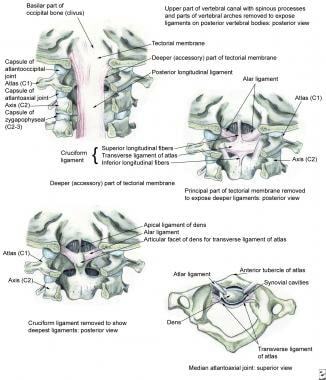 The alar ligaments originate from the posterolateral aspect of the dens of C2 and insert on the medial surfaces of the occipital condyles. When a single alar ligament is cut, axial rotation increases significantly to both sides; thus, both ligaments are required to be intact for restraining motion. Alar ligaments are stretched the most when the head is rotated and flexed together, and the ligaments are relaxed during extension. The anterior aspect of the transverse ligament acts as the pivot about which C1 (ie, the atlas) rotates. Holding the odontoid process of C2 against the anterior ring of the atlas, the transverse ligament functions as a restraining band on the dens. Flexion and anterior displacement of the atlas is restrained by its orientation. The facet joint capsules are strong fibrous structures that contribute to posterior stability. A muscle injury or reaction of some degree is associated with almost every cervical injury. 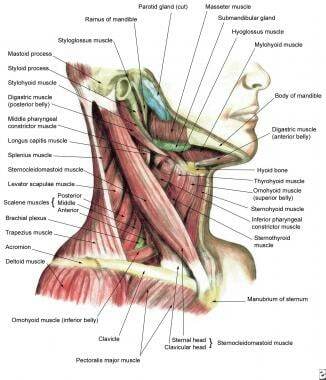 The musculature of the neck is vulnerable to the same types of injuries that affect muscles elsewhere in the body. The role of the muscles is to stabilize the spine, carry loads, and produce motion. The action of the intervertebral muscle forces is to restore the intervertebral motions of an injured spine to its intact values. 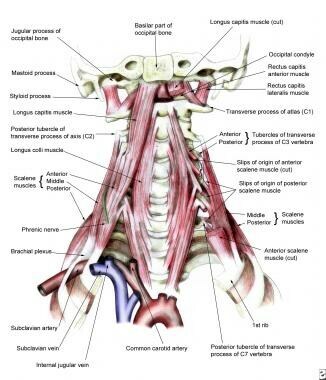 The images below illustrate several views of muscles of the neck. When contact is made with the head or body, deceleration injuries occur, and sudden flexion and extension of the neck can result. This type of injury is likely to occur in contact or collision sports such as football, soccer, rugby, or lacrosse. The posterior neck muscles may be strained when resisting flexion forces, and/or the anterior neck muscles may be strained when resisting hyperextension. Microtears or strains in these muscles are caused by the sudden muscular contractions that try to decelerate the applied force. Forced twisting, which is common in wrestling, can also cause a cervical strain. The twisting injury usually happens in the wrestler who is pinned on the mat, and a flexion-extension injury is more likely to happen during the takedown. Deceleration and rotational forces can also cause microtears or stretching of the small intertransverse and interspinous ligaments as well as the joint capsules. In cervical sprains, the immediate soft-tissue trauma occurs in the structures in and around the facet joints. This trauma occurs with varying severity, including multiple tears in ligamentous tissue with focal hematomas and hemorrhages. A fibrous tissue contraction is the net final effect of the repair of these strained capsular and ligamentous tissues so that restriction of motion and stiffening of the neck may eventually result. The short capsular ligaments of the Luschka interbody joints lack the normal laxity of the capsular structures surrounding the facet joints. Because of their anatomic position, the articulating surfaces of these vertebral body joints are particularly susceptible to injury from axial compression when the head is in a laterally tilted or neutral position. The cervical spine can absorb much of the imparted energy of collisions by dissipation through the normal lordotic curve of the cervical spine, the paravertebral musculature, and the intervertebral discs. However, when the neck is flexed about 30°, the forces applied to the top of the head are directed to a straight-segmented column because the normal lordotic curve is flattened. The cervical spine is then less able to dissipate the exerted forces in this situation, leading to fracture(s) and possible spinal cord injury. This proposed mechanism is supported by biomechanical studies that replicate it. In individuals with straight cervical spines, less energy is needed to fail under an axial load than in those with a normal lordotic curve; this finding underlines the importance of the cervical musculature in maintaining proper lordosis. Thomas BE, McCullen GM, Yuan HA. Cervical spine injuries in football players. J Am Acad Orthop Surg. 1999 Sep-Oct. 7(5):338-47. [Medline]. Watkins RG. Neck injuries in football players. Clin Sports Med. 1986 Apr. 5(2):215-46. [Medline]. Wroble RR, Albright JP. Neck and low back injuries in wrestling. Clin Sports Med. 1986 Apr. 5(2):295-325. [Medline]. 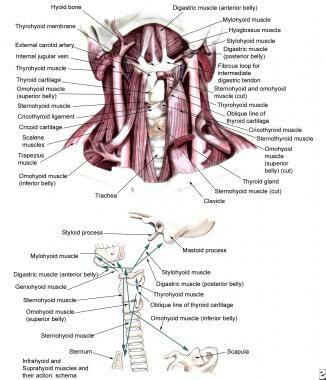 Bogduk N. The anatomy and pathophysiology of neck pain. Phys Med Rehabil Clin N Am. 2003 Aug. 14(3):455-72, v. [Medline]. Panjabi MM, Vasavada A, White AA III. Cervical spine biomechanics. Semin Spine Surg. 1993 Mar. 5(1):10-6. Holsgrove TP, Cazzola D, Preatoni E, Trewartha G, Miles AW, Gill HS, et al. An investigation into axial impacts of the cervical spine using digital image correlation. Spine J. 2015 Aug 1. 15 (8):1856-63. [Medline]. Kongsted A, Bendix T, Qerama E, et al. Acute stress response and recovery after whiplash injuries. A one-year prospective study. Eur J Pain. 2008 May. 12(4):455-63. [Medline]. Silber JS, Hayes VM, Lipetz J, Vaccaro AR. Whiplash: fact or fiction?. Am J Orthop. 2005 Jan. 34(1):23-8. [Medline]. Cronin DS. Finite element modeling of potential cervical spine pain sources in neutral position low speed rear impact. J Mech Behav Biomed Mater. 2013 Feb 4. [Medline]. Junge A, Dvorak J. Injury surveillance in the World Football Tournaments 1998-2012. Br J Sports Med. 2013 Aug. 47(12):782-8. [Medline]. [Full Text]. Sciubba DM, McLoughlin GS, Gokaslan ZL, et al. Are computed tomography scans adequate in assessing cervical spine pain following blunt trauma?. Emerg Med J. 2007 Nov. 24(11):803-4. [Medline]. Kaiser JA, Holland BA. Imaging of the cervical spine. Spine. 1998 Dec 15. 23(24):2701-12. [Medline]. Torg JS. Management guidelines for athletic injuries to the cervical spine. Clin Sports Med. 1987 Jan. 6(1):53-60. [Medline]. Cibulka MT. Evaluation and treatment of cervical spine injuries. Clin Sports Med. 1989 Oct. 8(4):691-701. [Medline]. Sawyer M, Zbieranek CK. The treatment of soft tissue after spinal injury. Clin Sports Med. 1986 Apr. 5(2):387-405. [Medline]. Langer PR, Fadale PD, Palumbo MA. Catastrophic neck injuries in the collision sport athlete. Sports Med Arthrosc. 2008 Mar. 16(1):7-15. [Medline]. Webb JK, Broughton RB, McSweeney T, Park WM. Hidden flexion injury of the cervical spine. J Bone Joint Surg Br. 1976 Aug. 58(3):322-7. [Medline]. [Full Text]. Ellis JL, Gottlieb JE. Return-to-play decisions after cervical spine injuries. Curr Sports Med Rep. 2007 Jan. 6(1):56-6. [Medline]. Torg JS, Glasgow SG. Criteria for return to contact activities following cervical spine injury. Clin J Sports Med. 1991. 1(1):12-26. Warren WL Jr, Bailes JE. On the field evaluation of athletic neck injury. Clin Sports Med. 1998 Jan. 17(1):99-110. [Medline]. Vegso JJ, Lehman RC. Field evaluation and management of head and neck injuries. Clin Sports Med. 1987 Jan. 6(1):1-15. [Medline]. An HS. 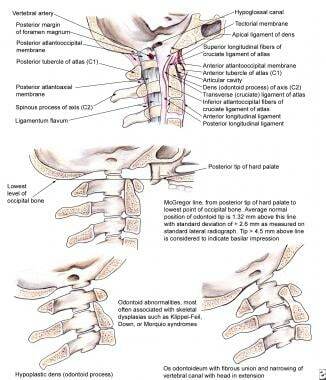 Cervical spine trauma. Spine. 1998 Dec 15. 23(24):2713-29. [Medline]. Cole AJ, Farrell JP, Stratton SA. Cervical spine athletic injuries: a pain in the neck. Phys Med Rehabil Clin N Am. 1994 Feb. 5(1):37-68. Dvorak MF, Fisher CG, Fehlings MG, et al. The surgical approach to subaxial cervical spine injuries: an evidence-based algorithm based on the SLIC classification system. Spine. 2007 Nov 1. 32(23):2620-9. [Medline]. Jackson DW, Lohr FT. Cervical spine injuries. Clin Sports Med. 1986 Apr. 5(2):373-86. [Medline]. Villavicencio AT, Hernandez TD, Burneikiene S, Thramann J. Neck pain in multisport athletes. 1: J Neurosurg Spine. 2007 Oct. 7(4):408-13. [Medline]. McLoughlin LC, Jadaan M, McCabe J. Severe sprains of the sub-axial cervical spine in adolescents: a diagnostic and therapeutic challenge: a report of three cases. Eur Spine J. 2014 May. 23 Suppl 2:150-6. [Medline].